In honor of today’s 9th anniversary of the original iPhone launch: Steve Jobs PISSED OFF moments (1997-2010). Features that classic moment when he asked journalists to stop doing their job. Sorry, Steve, no chance. The reason there were 500 base stations is that Apple didn’t want to provide Internet for the room. That changed fast. Last night in the @atpfm chatroom the Tipster said the reason iOS has Ethernet support is because of that demo fail. See also: Steve Jobs FUNNIEST moments, which I like even better, and Steve Jobs contradicting moments. The Google codebase includes approximately one billion files and has a history of approximately 35 million commits spanning Google’s entire 18-year existence. The repository contains 86TB of data, including approximately two billion lines of code in nine million unique source files. Most developers access Piper through a system called Clients in the Cloud, or CitC, which consists of a cloud-based storage backend and a Linux-only FUSE file system. Developers see their workspaces as directories in the file system, including their changes overlaid on top of the full Piper repository. CitC supports code browsing and normal Unix tools with no need to clone or sync state locally. Developers can browse and edit files anywhere across the Piper repository, and only modified files are stored in their workspace. This structure means CitC workspaces typically consume only a small amount of storage (an average workspace has fewer than 10 files) while presenting a seamless view of the entire Piper codebase to the developer. Trunk-based development is beneficial in part because it avoids the painful merges that often occur when it is time to reconcile long-lived branches. Development on branches is unusual and not well supported at Google, though branches are typically used for releases. Release branches are cut from a specific revision of the repository. Bug fixes and enhancements that must be added to a release are typically developed on mainline, then cherry-picked into the release branch. […] When new features are developed, both new and old code paths commonly exist simultaneously, controlled through the use of conditional flags. This technique avoids the need for a development branch and makes it easy to turn on and off features through configuration updates rather than full binary releases. The Android and Chrome teams are separate and use Git. There are a few video games that I’m unable to play because they require quick sorting of colors that I have difficulty differentiating. Some of them have special modes for people like me; others just never think about it. The developers of Destiny did a lot of work to update the game’s controls and heads-up display in order to make it more usable by people who can’t perceive colors the way most people do. More importantly, the new App Extensions architecture enables developers to distribute Safari Extensions as part of their app through the App Store. Safari app extensions are available in OS X 10.12 and later and in OS X 10.11.5 when Safari 10 is installed. Using a Safari app extension, you can add new functionality to Safari, read and modify web page content, and communicate with your native application to integrate its content into Safari or send web data to your app. Because there are no standardized, widely accepted behaviors for input masks, it’s best to avoid «magical» behaviour (e.g. automatically entering characters that the user did not type), or, if you do need magical behavior, also account for user behavior that does not expect magical behavior. For example, if the field auto-tabs to the next field, and the user also tabs right after filling in a field, it might be best to ignore the user’s tab. If you create a new control that kind of looks like an existing control, the new control should not violate people’s expected behavior of the existing control. In other words, text fields with input masks’ behavior should be as close to a normal text field’s behavior as possible. To most readers of this blog, the fact that fonts are a very significant attack vector does not have to be reiterated. There are a number of different file formats in active use. These formats are extremely complex, both structurally and semantically. As a result, they are correspondingly difficult to implement correctly, which is further amplified by the fact that a majority of currently used font rasterizers date back to (early) 90's, and were written in native languages such as C or C++. Controlled font files are also deliverable through a variety of remote channels – documents, websites, spool files etc. Last but not least, the two powerful virtual machines executing programs describing glyph outlines in the TrueType and OpenType formats have proven vastly useful for creating reliable exploitation chains, thanks to the ability to perform arbitrary arithmetic, bitwise and other operations on data in memory. For all of these reasons, fonts have been an attractive source of memory corruption bugs. If nothing else, the effort and its results are evidence that fuzzing, if done correctly, is still a very effective approach to vulnerability hunting, even with theoretically “mature” and heavily tested code bases. Furthermore, the two bug collisions prove that Windows kernel font bugs are still alive and kicking, or at least were actively used in the wild in 2015. In the second post of the series, we will discuss the meaty parts of the research: how we prepared the input corpus, mutated and generated interesting font samples, fuzzed the Windows kernel at scale, reproduced the crashes and minimized them. There is no better depiction of the history of the Macintosh than the old issues of MacWorld Magazine. For your reading pleasure is a complete MacWorld Magazine collection from 1984 through 1994. Color scans in PDF format. I really enjoyed flipping through some old issues of Macworld (note the capitalization) recently before recycling them. The ads, in particular, are very different from what we’re used to seeing now. For your pleasure, here’s a comprehensive list of scenes you can search for. I would love to see this kind of thing in Lightroom. It’s not just the format itself, but how it is used. Because Scrivener projects comprise many files, it’s important that any given project is synced in its entirety and not piecemeal. If an updated binder structure is downloaded, it’s not much use if none of the new files it references are yet available, for instance. Dropbox gives us the control we need in this regard. This is also the reason that the sync needs to be invoked manually rather than continually happening in the background. With background sync (which iCloud always uses), there is no control over which files appear when, meaning that important structural files could download without the files they refer to or vice versa. This is an even more serious problem when the connection is lost part-way through a sync. All too easily this could put a project into an inconsistent state that could wreak havoc, and we’d rather have users complaining that they don’t like manual sync than that they have just lost four hours of writing or structural changes! Model: Outline contains Items each of which has attributes and an AttributedString body. Runtime: Change events, undo support, query evaluator, and relative date/time parsing. There’s also a Swift wrapper. I think it’s great that Apple wants to provide templates for the design resources they’re asking developers to deliver, but the ones they’ve put out is not only a lot less practical than the 3rd party resources available, they’re also factually wrong — using bitmap roundrects instead of the platform standard squircle. Until Apple feels like dedicating more time to helping developers deliver better assets, it looks like there’ll be plenty of reasons why we still have 3rd party resources around. Anyway, long story short, I got it about 98% done before running out of both time and motivation - the implementation is feature-complete and generally pretty polished and bombproof, but there’s still some holes to fill in test coverage and user documentation. So, if the AppleScript community would like a chance to help itself then here it is: I want someone experienced in AppleScript and [AppleScriptObjC], and preferably with some actual programming skills as well (cos this is not just toy code), to step up and officially take the whole project over from me over the next couple of weeks. That’s full ownership, BTW: all copyright, choice of license, project management, etc. The rejection was not only disappointing and heart-breaking for us, as we had put several months of hard work into the app, but we also found the reason very hard to believe. Homescreen.me is merely a platform that showcases user submitted content, something that other apps like Twitter, Facebook, Reddit etc. already do. Example — what if someone shares a homescreen image on Twitter? Is that a violation too? Unfortunately, Apple just wouldn’t budge. A work-around, we were told, was to offer users a simple text area where they can type which apps they use on their Homescreens. Betaworks launched a similar app called “#Homescreen” which, though it had app review issues of its own, was never sanctioned for intellectual property issues. I built an app that simulates homescreen for testing icons. Similar problem. Today’s outage comes a few weeks after a previous widespread outage took out Apple Music, iCloud Music Library, and iCloud. Apple has previously remained quiet when these outages occur, relying on using the System Status page to communicate to customers of any issues. Zac Hall had previously delved into how Apple should better handle these situations, especially when they expect customers to put more faith in them for future cloud-based services. Previously: App Store Search Is Currently Broken. Apple Maps has been down for many hours today, causing mayhem for customers seemingly worldwide. Whilst Apple’s system status reports no issues, users across Twitter and Apple Support forums are finding that is currently impossible to search for locations or get directions. The map tiles appear to be loading normally, but points of interest and critical functions of the app are simply not working. Obviously, Apple didn’t go to all that trouble only because they wanted us to use a different (and obviously better) API. The UserNotifications framework actually gives us access to many new, long-awaited features. This thesis presents efficient algorithms for internal and external parallel sorting and remote data update. The sorting algorithms approach the problem by concentrating first on highly efficient but incorrect algorithms followed by a cleanup phase that completes the sort. The remote data update algorithm, rsync, operates by exchanging block signature information followed by a simple hash search algorithm for block matching at arbitrary byte boundaries. The last chapter of the thesis examines a number of related algorithms for text compression, differencing and incremental backup. We have used protocol and protocol extensions to make our code more readable. We have also used a few other tricks, but the main gist is that you can create small helpers in your code to make your life easier, and make life easier for other people that have to read your code. Using old APIs is great because they have been battle-tested; it is code that has been around for many years… and, for many years, bugs have been fixed. But we can make these APIs even better (and make our lives easier). When we create these helpers, it is important to keep the spirit of the original implementation. We want to make it easy for other people who read the code, and that who may not know about these wrappers. Swift condition clauses appear in guard, if, and while statements. This proposal re-architects the condition grammar to enable an arbitrary mix of Boolean expressions, let conditions (which test and unwrap optionals), general case clauses for arbitrary pattern matching, and availability tests. It removes where clauses from optional binding conditions and case conditions, and eliminates gramatical ambiguity by using commas for separation between clauses instead of using them both to separate clauses and terms within each clause. These modifications streamline Swift's syntax and alleviate the situation where many Swift developers don't know they can use arbitrary Boolean conditions after a value binding. Objective-C developers learning Swift often wonder how to represent something like UIViewController<MyProtocol>. The simple answer is that there's currently no way to directly represent that construct in Swift as of Swift 2.2. However, it's possible to work around it fairly easily with just a tiny bit of extra code. To make a long story short, it sounds like Apple is going to be collecting a lot more data from your phone. They’re mainly doing this to make their services better, not to collect individual users’ usage habits. To guarantee this, Apple intends to apply sophisticated statistical techniques to ensure that this aggregate data -- the statistical functions it computes over all your information -- don’t leak your individual contributions. In principle this sounds pretty good. But of course, the devil is always in the details. The total allowed leakage is often referred to as a “privacy budget”, and it determines how many queries will be allowed (and how accurate the results will be). The basic lesson of DP is that the devil is in the budget. Set it too high, and you leak your sensitive data. Set it too low, and the answers you get might not be particularly useful. A much more promising approach is not to collect the raw data at all. This approach was recently pioneered by Google to collect usage statistics in their Chrome browser. The system, called RAPPOR, is based on an implementation of the 50-year oldrandomized response technique. The main challenge with randomized response systems is that they can leak data if a user answers the same question multiple times. What we know about anonymization is that it’s much harder than people think, and it’s likely that this technique will be full of privacy vulnerabilities. (See, for example, the excellent work of Latanya Sweeney.) As expected, security experts are skeptical. Microsoft Research the birth place of Differential Privacy has abandoned it. In order to asses accuracy/utility/privacy trade-off correctly one must posses enough information about queries expected, and how much privacy budget should be allocated towards them. Keeping track of queries and budget consumed is even more difficult. Certain tasks require answers to be computed as exactly as possible. The impact from answering such queries and resulting depletion of privacy budget has never been examined in literature. There have been few attempts at rigorously evaluating privacy budgets and parameters such as epsilon. However they have only shown Differential Privacy to be impractical. You will encounter strong resistance and in some cases outright bullying from vocal supporters of Differential Privacy. These people will likely be completely unfamiliar with your area of application and existing practices. They will barge in into public meetings proclaiming that Differential Privacy is the only real solution. And that researchers who have spent years working with data in that field should be ignored. Even when several papers have called for further study of Differential Privacy before adoption in practice. Moritz Hardt presents a “Tutorial on Differential Privacy in the Theory Community” at the DIMACS Workshop on Recent Work on Differential Privacy Across Computer Science, held Wednesday, October 24th 2012 at the Computing Research & Education Building on Busch Campus of Rutgers University. This event was presented under the auspices on the DIMACS Special Focus on Information Sharing and Dynamic Analysis and the DIMACS Special Focus on Cybersecurity. There’s been a lot of confusion about differential privacy and what it means for end users, leading Recode to write a piece that clarifies many of the details of differential privacy. First and foremost, as with all of Apple’s data collection, there is an option to opt out of sharing data with the company. Differential data collection is entirely opt in and users can decide whether or not to send data to Apple. Amazing tip from Xcode labs: add a EXCLUDED_SOURCE_FILE_NAMES build setting to conditionally exclude sources for different configuration. There’s also an INCLUDED_SOURCE_FILE_NAMES, and they can be used together (exclude that, but include this). A major change from Xcode 7 is that Xcode now requires that every target in your project specify a development team, even when the manual code signing option is selected. The new PROVISIONING_PROFILE_SPECIFIER build setting will impart the desired team information to Xcode, even if provisioning profiles are not used. This doesn’t exactly solve the challenge for open source projects, because organizations using an open source project will still have to override the configuration file or build settings for the projects they check out. So, the fix in Xcode 8, with the 10.12 SDK, is to delete those parentheses so Swift appreciates that it’s accessing a property. But doing so will break the build back on the 10.11 SDK. What’s a forward-looking, backward-looking developer to do? Unfortunately, I think the only way to convince Swift to absolutely ignore the problematic line is to use a Swift compiler check, instead. Note that this is a bad solution because we are fundamentally not concerned about the version of Swift being used. In my opinion, we need a compile time, conditional code exclusion that operates on the SDK, similarly to #available. Something like “#if sdk(OSX 10.12)”. As far as I know, nothing like this exists. Source Extensions have several capabilities and are organized around commands. Each extension can provide a list of commands in its plist file or via an override of XCSourceEditorExtension. Each command specifies what XCSourceEditorCommand subclass implements the command, the name on the menu, and a unique identifier. The same class can implement several commands by switching on the identifier. The first parameter is an XCSourceEditorCommandInvocation. That invocation has the contents of the editor’s text buffer (either as a single string or as an array of lines). It also has the selections, and each selection has a start and end that tell you the line and column (which can be used to index into the text buffer’s lines array). If nothing is selected, the single XCSourceTextRange in the array will have the same start and end point representing the insertion point. See also: WWDC Session 414: Using and Extending the Xcode Source Editor. Xcode 8 brings the dark art of customized code signing and provisioning profiles into the light for all to see. Instead of being buried in the Build Settings, Code Signing is now displayed front and center in the General tab. When “Automatically manage signing” is unchecked we can specifically select the provisioning profile we wish to use for each Configuration. Now this in itself is nothing new, we have always been able to do this in the Build Settings tab. The awesome sauce comes in with the smarts that Xcode 8 displays here. The drop down list of profiles now groups the Eligible profiles above the Ineligible profiles. Meaning that profiles that match the bundle identifier absolutely or with a wild card will be displayed above any profiles that don’t match at all. The Xcode team has included a new report in the Report Navigator that outlines everything Xcode does on your behalf related to code signing. Xcode 8 no longer supports iOS 7 as a deployment target, so if you add support for iOS 10, you’ll lose iOS 7 support. I took a break from converting projects to Swift 3 this weekend and instead played around with writing a new “Source Editor Command” extension for Xcode 8. The result is an extension that detects and corrects whitespace issues. It’s a topic I’ve touched on before because I’m frustrated by the continuous burden of correcting whitespace in my projects. I wanted to see if an Xcode source extension could reduce my annoyance with this issue. The fun part of this exercise for me was writing a pushdown automaton parser where all of the parser logic was expressed through the case patterns of a single Swift switch statement. Accordingly, most of this article is not really about Xcode Source Editor Command extensions or whitespace issues but is actually about design choices related to large, complex switch statements in Swift: choosing data types to switch upon, designing case patterns to handle a deep decision tree in a single switch statement, when to use custom pattern matching and when to use where clauses. To stop the Xcode 8 iOS Simulator from logging like crazy, set OS_ACTIVITY_MODE = disable in your debug scheme. I’m pleased to announce the release of Script Debugger 6. This release introduces over 25 new features and embraces modern AppleScript, including AppleScriptObjC. To sweeten the deal, Script Debugger’s price has been reduced by 50%! If you distribute scripts, chances are you want them to pass muster with Mac OS X’s Gatekeeper, and that means code signing them. Script Debugger 6 makes this task almost invisible with its always-on code signing. Turn it on, and your script is code signed every time it is saved. No more exporting, no more forgetting. AppleScript’s progress properties are a great way of displaying a script’s progress in an applet, and now you can display them as you run your scripts in Script Debugger 6. Before Script Debugger 6, working with AppleScriptObjC required specialist software. This powerful technology often requires you to type verbose code, and is unforgiving about case — something foreign to typical scripters. Script Debugger 6’s code completion tools do much of the typing for you and address common problems. Debugging AppleScriptObjC is a bear because AppleScript cannot display values you are working with. Script Debugger 6 fixes this by displaying AppleScriptObjC values as you step through your code — there is no more guessing. Update (2016-06-29): See also: Howard Oakley. When the first Turing Award winner -- Al Perlis -- was asked in the 60s “What is Computer Science?”, he said “It is the science of processes!”. He meant all processes including those on computers, but also in Biology, society, etc. His idea was that computing formed a wonderful facility for making better models of pretty much everything, especially dynamic things (which everything actually is), and that it was also the kind of thing that could really be understood much better by using it to make models of itself. We never explicitly declared that nilPerson should be an ImplicitlyUnwrappedOptional. And it’s not great that the compiler inferred unsafe type information. Gone is the awkward mix of swiping: Instead, the Lock screen as displayed takes advantage of content in each direction; swipe from the top for Notification Center, right for the Widgets screen, left for the Camera app, or bottom for Control Center. Along the bottom of the Lock screen are page indicators like those on the Home screen — another indicator that more content hides out of reach on each side. With these changes, iOS 10 paints a much clearer visual map for users, built in layers: On the top layer, you have Actions: Notification cards, Widgets, Control Center, and 3D Touch options; on the bottom layer, you have the Home screen; and the middle layer holds your Lock screen (if locked) or other app-related content (if unlocked). By making each bit of iOS UI its own distinct layer, this also opens up greater horizontal interactions, as with Control Center. As seen in the keynote, Control Center now lives inside a hovering bubble layer, with a Music widget and Home widget just a left swipe away. As part of iOS 7, Apple bet big on thinner font faces legible at small sizes; with iOS 10, the company is re-embracing font size and weight. In part, the bigger font faces provide for readable, tappable touch targets: In the future, instead of stabbing furiously at the tiny mini-player on the bottom of the iOS 9 app, I can look forward to tapping an element double in size, with clearly demarcated play/pause buttons and no More (...) button in sight. I like these buttons that look like buttons in iOS 10. By default, Safari  no longer tells websites that common plug-ins are installed. It does this by not including information about Flash, Java, Silverlight, and QuickTime in navigator.plugins and navigator.mimeTypes. This convinces websites with both plug-in and HTML5-based media implementations to use their HTML5 implementation. When a website directly embeds a visible plug-in object, Safari instead presents a placeholder element with a “Click to use” button. When that’s clicked, Safari offers the user the options of activating the plug-in just one time or every time the user visits that website. Here too, the default option is to activate the plug-in only once. It’s kind of amazing we made it this far - only TidBITs and MacWorld are older and still around - but we’ve been told we’re packing it in. We’ve joked before that Apple becoming a huge mainstream company is the worst thing that ever happened to us, but it’s true: there’s less need for an Apple-specific news site when news about Apple is plastered everywhere, on every site, all the time. This is not the sole reason why we’re having to give up our comfy home (and just after repainting it, too! ), but it’s part of the reality we’ve been working in. I’ve been reading MacNN since the beginning. It was one of the essential “blogs” from the early Mac Web, along with sites like MacInTouch, MacFixIt, MacCentral, and The Mac Resource Page. Sadly, the Mac news site MacNN, founded in 1995, has announced that it will no longer be publishing regularly, and the venerable New York City Apple reseller Tekserve is closing its doors for retail sales and service. On the upside, particularly for those trying to establish the technical particulars of some older Mac model, the Apple spec site EveryMac.com celebrated its 20th anniversary on 2 July 2016 and the spec app Mactracker marked its 15th anniversary back on 14 May 2016. In March 2013, I chronicled the problems developers were having with Core Data iCloud syncing. Many concluded that the basic NSPersistentStoreUbiquitousContent design was flawed. Bugs could be fixed, but it would never be able to do what people wanted. Apple didn’t give the impression that it thought there were major problems. It kept reporting minor improvements and bug fixes. When CloudKit was announced in 2014, it had no official Core Data story. As far as I know, there is still isn’t one. Meanwhile, Drew McCormack built the Ensembles framework, which fixes just about all the problems with Apple’s design and works with both CloudKit and Dropbox. Fast forward to WWDC 2016. When installing the Xcode 8 beta, I noticed that all of the symbols related to iCloud Core Data were marked as deprecated in macOS 10.12 and iOS 10, with the comment “Please see the release notes and Core Data documentation.” Strangely, the Core Data release notes and What’s New in macOS 10.12 documents make no mention of this. What’s New in iOS 10 simply says that “Several NSPersistentStoreCoordinator symbols related to ubiquitous content” have been deprecated. I asked on Twitter what was up, and no one seemed to know. No one had anything nice to say about iCloud Core Data, either, though no doubt many developers still rely on it. I hoped that all would be explained in today’s WWDC Session 242: What’s New in Core Data. Alas, reports are that absolutely nothing was said about iCloud in the session. A key technology that underpins apps is (apparently) to be removed, and Apple didn’t tell anyone at its own developer conference. In my view, this is shameful. The issue is more acute than with a normal deprecation because the APIs rely on cloud services, which could conceivably stop working even for older OS versions where they are not deprecated. It seems clear that the way forward is Ensembles, unless you want to write your own sync engine or wait for Apple to announce one. I hope that the deprecation will spur more of the community to coalesce around Ensembles. On a more positive note, it looks like there are a lot of great developments in Core Data this year, including the integration of a mogenerator-like tool into Xcode and, apparently, the end of NSObjectInaccessibleException, which doesn’t play well with Swift. If you move to Ensembles now, you not only get the usual support, documentation, and source code, you also get it all at half the standard price. The sale will continue until macOS Sierra is released later this year. Update (2016-06-19): See the comments on Hacker News. Apps will continue to work for the foreseeable future. Aside from the deprecation warnings, there are no changes to or removal of the functionality in iOS 10. We don’t have any specific time line to announce now, but traditionally deprecated symbols on our platform remain functional for a considerable period of time before removal. However, App Store Review Guidelines say that apps cannot use deprecated technologies. Last time I dove in to iCloud I lost a year of schedule and an evangelist eventually called me a masochist for continuing to try. APFS also adds a copy-on-write metadata scheme that Apple calls “Crash Protection,” which aims to ensure that file system commits and writes to the file system journal stay in sync even if something happens during the write—like if the system loses power. Snapshots and clones both are going to be available in APFS. Snapshots let you throw off a read-only instance of a file system at any given point in time; as the file system’s state diverges away from the snapshot, the changed blocks are saved as part of the snapshot. This is similar in concept to Microsoft’s shadow copies, and it’s an incredibly handy feature. There are obviously huge implications here in how Time Machine works—a true file system set of snapshots could totally replace the kludgy and aging mechanism of hard links that Time Machine builds and maintains. Clones differ from snapshots in that clones are writable instead of read-only. According to the documentation, APFS can create file or directory clones—and like a proper next-generation file system, it does so instantly, rather than having to wait for data to be copied. A cloned file or directory stores the changes made between it and the original objects, giving you a writable, editable, point-in-time copy of a file or a directory. As the documentation points out, this is an easy way to create document revisions or do versioning of anything you might want to track. Also interesting is the concept of “space sharing,” where multiple volumes can be created out of the same chunk of underlying physical space. This sounds on first glance a lot like enterprise-style thin provisioning, where you can do things like create four 1TB volumes on a single 1TB disk, and each volume grows as space is added to it. You can add physical storage to keep up with the volume’s growth without having to resize the logical volume. I did get confirmation that Apple intends to provide an open specification in 2017 when the design is finalized. They also emphasized that the data structures are designed to be extended in backward and forward compatible ways so things like parity checks should be easily implemented even if they don’t make the first release. Finally there is Bit Rot. Over time data stored on spinning hard disks or SSDs degrade and become incorrect. […] HFS+ lost a total of 28 files over the course of 6 years. By the next WWDC it seemed that Sun had been forgiven. ZFS was featured in the keynotes, it was on the developer disc handed out to attendees, and it was even mentioned on the Mac OS X Server website. Apple had been working on their port since 2006 and now it was functional enough to be put on full display. I took it for a spin myself; it was really real. The feature that everyone wanted (but most couldn’t say why) was coming! I’m told by folks in Apple at the time that certain leads and managers preferred to build their own rather adopting external technology—even technology that was best of breed. They pitched their own project, an Apple project, that would bring modern filesystem technologies to Mac OS X. The design center for ZFS was servers, not laptops—and certainly not phones, tablets, and watches—his argument was likely that it would be better to start from scratch than adapt ZFS. Combined with the uncertainty above and, I’m told, no shortage of political savvy their arguments carried the day. Licensing FUD was thrown into the mix; even today folks at Apple see the ZFS license as nefarious and toxic in some way whereas the DTrace license works just fine for them. Note that both use the same license with the same grants and same restrictions. Maybe the technical arguments really were overwhelming (note however that ZFS was working internally on the iPhone), and maybe the risks really were insurmountable. I obviously have my own opinions, and think this was a great missed opportunity for the industry, but I never had the burden of weighing the totality of the facts and deciding. Nevertheless Apple put an end to its ZFS work; Apple’s from-scratch filesystem efforts were underway. In the 7 years since ZFS development halted at Apple, they’ve worked on a variety of improvements in HFS and Core Storage, and hacked at at least two replacements for HFS that didn’t make it out the door. This week Apple announced their new filesystem, APFS, after 2 years in development. It’s not done; some features are still in development, and they’ve announced the ambitious goal of rolling it out to laptop, phone, watch, and tv within the next 18 months. At Sun we started ZFS in 2001. It shipped in 2005 and that was really the starting line, not the finish line. Previously: ZFS, The Loss of ZFS. See also: WWDC Session 701: Introducing Apple File System, ZFS data integrity explained, Trust, But Verify, Belt and Suspenders, Computational Skeuomorphism. APFS, the Apple File System, was itself started in 2014 with Dominic as its lead engineer. It’s a stand-alone, from-scratch implementation (an earlier version of this post noted a dependency on Core Storage, but Dominic set me straight). I asked him about looking for inspiration in other modern file systems […] he was aware of them, but didn’t delve too deeply for fear, he said, of tainting himself. Cloning fixes an important problem with hard links. The issue with hard links is that some applications will write “into” hard links, effectively changing both “copies” of the file, and other applications will “break” the link (copy on write). Apple controls the full stack including the SSD, FTL, and file system; they could have built something differentiated, optimizing this components to work together. What APFS does, however, is simply write in patterns known to be more easily handled by NAND. APFS also focuses on latency; Apple’s number one goal is to avoid the beachball of doom. APFS addresses this with I/O QoS (quality of service) to prioritize accesses that are immediately visible to the user over background activity that doesn’t have the same time-constraints. APFS removes the most common way of a user achieving local data redundancy: copying files. A copied file in APFS actually creates a lightweight clone with no duplicated data. Corruption of the underlying device would mean that both “copies” were damaged whereas with full copies localized data corruption would affect just one. APFS checksums its own metadata but not user data. The justification for checksumming metadata is strong: there’s relatively not much of it (so the checksums don’t consume much storage) and losing metadata can cast a potentially huge shadow of data loss. If, for example, metadata for a top level directory is corrupted then potentially all data on the disk could be rendered inaccessible. ZFS duplicates metadata (and triple duplicates top-level metadata) for exactly this reason. Explicitly not checksumming user data is a little more interesting. […] Apple engineers I spoke with claimed that bit rot was not a problem for users of their devices, but if your software can’t detect errors then you have no idea how your devices really perform in the field. ZFS has found data corruption on multi-million dollar storage arrays; I would be surprised if it didn’t find errors coming from TLC (i.e. the cheapest) NAND chips in some of Apple’s devices. This is disappointing. EagleFiler has detected lots of bit rot for me over the years, including on SSDs, and I’ve seen lots of unviewable old JPEG files. Those are great goals that will benefit all Apple users, and based on the WWDC demos APFS seems to be on track (though the macOS Sierra beta isn’t quite as far along). Update (2016-06-27): See also: TidBITS, comments on ArsTechnica, comments on Hacker News, Accidental Tech Podcast. Update (2016-07-03): See also: Accidental Tech Podcast. If you’ve used Git, you’ve probably looked at a lot of diffs. Most of the time the diff shows exactly what you did: changed some lines, added some new ones, or took some away. But because Git generates the diff only from seeing the “before” and “after” states of your files, sometimes the way it shows the changes can be pretty confusing. The author probably didn’t write the loop as two out-of-order halves. But because the outer lines of the old and new loops are the same, it’s equally valid to attribute the lines either way (it’s tempting to say that the problem can be solved by always starting the added lines at the top, but that only fixes this case; you’d have the opposite problem if the new loop were added after the old). In 2.9, Git’s diff engine learned a new heuristic: it tries to keep hunk boundaries at blank lines, shifting the hunk “up” whenever the bottom of the hunk matches the bottom of the preceding context, until we hit a blank line. It’s experimental, so you have to enable diff.compactionHeuristic with git config. Xcode 7.3.1 comes with Git 2.7.4, and the Xcode 8 beta comes with 2.8.1. Cornerstone 3 implements sandboxing in order that we can continue to offer Cornerstone to Mac App Store customers. […] The implementation of sandboxing in Cornerstone was extremely challenging. While many other developers have either given up or taken the opportunity to remove their apps from the Mac App Store citing the difficulty of implementing sandboxing, we have invested heavily into re-engineering significant parts of Cornerstone to not just work within the confines of sandboxing, but to embrace it. Looks like a huge update. They also sell direct, which is the only way to get the upgrade discount. There were rumors that Connect was going to be deleted, but apparently Apple is going to try to make it work. It’s is a good idea for Connect to be in the For You section, instead of having its own tab. Switch to Browse to see what’s new, and what’s not. Again, there are text tabs in the window, rather than using a menu. New Music shows what’s new on Apple Music, Curated Playlists is what it says, then you see Top Charts, if you want to know what’s popular, and Genres takes you to a rather boring page of text links from which you can access a number of genres. The options within each genre haven’t changed, but the fonts have. Here are a few screenshot of Apple Music on iOS; as you can see, they essentially reproduce the same elements as iTunes, just in a vertical layout. One problem I see is the size of the artwork for playlists and albums; it should be smaller, so you can see a bit more content. David Barnard and Paul Haddad are finding that when someone searches for their apps—by exact name—the App Store shows a search ad for a competing app at the top of the search results. This is exactly the sort of thing developers feared when search ads were announced. Update (2016-06-16): @manolosavi is getting both an ad and an organic search result for the same app (via Preshit Deorukhkar). This is also bad because developers shouldn’t have to pay when they are already the top result. Schiller talked about this in The Talk Show live. Short version from memory: this is allowed and benefits small devs more than big. I’m very skeptical that this is a benefit for developers (who would have to outbid others just to protect their own app’s name as a search term) or for users (who expect what they search for to be at the top). Note, also, how the ad takes up more of the screen than the actual matching search result. A very large company like Facebook could conceivably bid on all major social networking keywords, for example, and push down any competitors on the search results page. Or, in a more nefarious scenario, a well-funded low-quality or knockoff app could bid its way to the top of search. I’d hope Apple puts a stop to this; it would be inadequate to simply add “Report” buttons for ads that engage in this sort of behaviour. 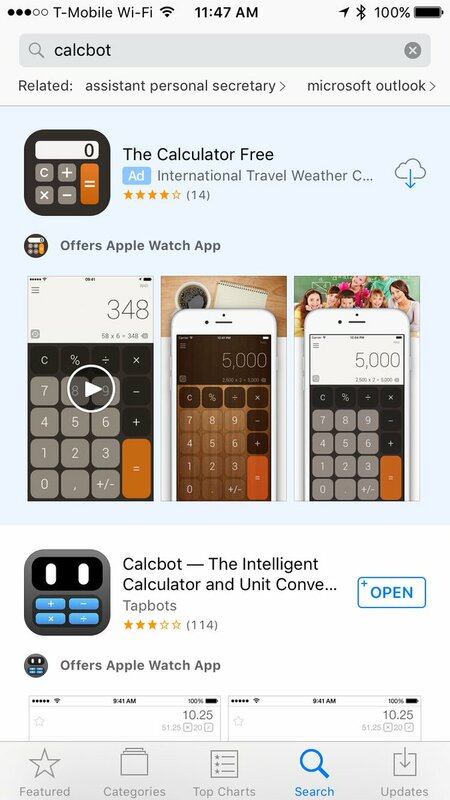 Update (2016-06-17): Searching for PCalc shows an ad for PCalc Lite above the actual Calc. Update (2016-06-20): Phil Schiller talked more search ads at The Talk Show Live. Update (2016-06-21): Another example from Paul Haddad. Watching ‘Introducing Search Ads’ so in a few years when all my indie developer friends go back to consulting I’ll know why. Apple claims to possess a unique set of values and beliefs including raising the bar. Pretty sure this does the opposite. It’s like modern Apple though. Ask yourself, who does this help? I have asked, and can’t think of anybody but deep-pocketed developers with non-definitive search results. An ad for 2048 shows up at the top of the @AppStore when you search for “Threes” in iOS 10. I am rarely as convinced that an Apple move is bad as I am with paid App Store placement. It defies my understanding of Apple’s values. The fact that the app in the first place got more clicks than the one on the 4th place was rather predictable. But the difference in those clicks is surprising: moving from the 4th place to the 1st increased the traffic share from 1% to 57%. In both alternatives, the top app whether it was an ad or not achieved by far the most clicks on the ‘Get’ button. A ‘search ad’ app received 57% of clicks and the top app in a regular search result – 71%. The relatively small gap in CTR means that users don’t see the difference between sponsored and organic listings. Update (2016-07-28): See also: David Chartier. Update (2016-08-25): See also: Oisín Prendiville. Google outbids Mozilla in the AppStore and shows up first for searches on “Firefox”. Would anyone be surprised if future versions of Mac OS X made additional features and APIs available only to App Store apps? Developer ID-signed apps can now take advantage of CloudKit, iCloud Keychain, iCloud Drive, remote (push) notifications, MapKit, and VPN entitlements. I say “almost” because iCloud key-value storage and Core Data are not mentioned in the document, although my impression from the WWDC session is that they will be included. Of course, this assumes that Apple does not renege on this, as it did with Map Kit and El Capitan. At WWDC, Apple is presenting the Mac App Store as the preferred way to distribute software. However, it still lags behind the iOS App Store in features. Developer ID apps have access to more APIs and more business models. Feels good to decouple the two, let MAS have its own value proposition apart from CloudKit, vice-versa. Basically, they remove all the reasons for MAS (together with paying for direct Mac apps using Apple Pay). Question is whether they have just given up on it. Wouldn’t be the first time Apple just leaves something for dead. The situation continues to get worse for unsigned apps. In macOS 10.12, the (graphical) preference to enable them has been removed, although there are still ways around that. Under what circumstances does App Translocation occur? First, the app must have a com.apple.quarantine extended attribute. If you delete the quarantine xattr, then App Translocation does not occur, and the app will launch from where it was unarchived, like normal. Second, the app must be opened by Launch Services. This usually means Finder, but it can also mean open from Terminal, for example. If you launch the app executable directly from bash, on the other hand, App Translocation does not occur. Third, the app must not have been moved — by Finder. If you move the app, using Finder, from the app’s original unarchived location to another folder, even a subfolder, e.g., ~/Downloads/Test/, then App Translocation does not occur. However, if you move the app using mv from Terminal, then App Translocation will still occur. Normally you would move the app from ~/Downloads to /Applications, and that would cause the app to be launched from /Applications like normal, but the locations of the particular folders don’t seem to matter. The mere act of moving the app using Finder stops App Translocation from happening. Indeed, once you’ve moved the app once, it will no longer experience App Translocation again, even if you then move it back to ~/Downloads. How does App Translocation affect us, as app developers? For the most part, the apps seem to work as before. After all, it shouldn’t matter whether your app is launched from /Applications, from ~/Downloads, or from the Xcode build folder. However, when the app runs from a read-only volume, it cannot update itself to a newer version. App Translocation prevents software update mechanisms such as Sparkle from working. See also: WWDC Session 706: What’s New in Security. The fundamental problem, the primary cause of both of the flaws I discovered, is that App Translocation happens automatically, without any awareness by or notification to the user, but App Translocation is turned off by a manual action by the user — moving the app bundle in Finder — again without any awareness or notification. The more I learn about App Translocation, the more I feel that it is a bad idea with a botched implementation. The problem with Gatekeeper Path Randomization is that copying applications to a read-only disk image will break functionality in many, if not most, existing applications. Perhaps most notable, features like automatic software updates (via Sparkle or similar mechanisms) will no longer work. Apple may not view this as an issue, given that GPR will be disabled once the user moves the application out of the Downloads folder. However, many users run applications from the Downloads folder, never moving them. This is especially common when a user is trying out an application prior to purchasing it, and an app that doesn’t work as expected due to GPR seems certain to lead to lost sales. Worse, even if the customer moves your app to their Applications folder, it may continue to be broken, depending on how your app is packaged. Because the vast majority of apps do not load external resources relative to the app bundle path, only a very small percentage of apps are vulnerable to the attack that Gatekeeper Path Randomization is attempting to prevent. Nevertheless, Apple’s current implementation for GPR affects all apps outside the Mac App Store, and the negative impacts will be felt far and wide. While we believe there are several changes Apple can and should make, a simple workaround would be to allow software developers to opt out of Gatekeeper Path Randomization. If an app does not load external app-relative resources, GPR provides no benefit. The app should thus be able to put a key in its Info.plist specifying that GPR should not apply to the app. I respect that Apple had a difficult choice. I’ve been thinking a lot about it, and I’m not sure exactly what mechanism I would use to protect against the repackaging problem. Gatekeeper Path Randomization is flawed, in my opinion, but there is no ideal solution. Any alternative I can think of would also have major downsides. This is why the Info.plist key is so important. The best way to prevent any problems or breakage caused by Gatekeeper Path Randomization is to avoid it completely. And we know it’s not necessary for most apps, because they aren’t vulnerable to repackaging, so there should be an easy way to indicate to Gatekeeper that an app doesn’t need it. It’s not naive to trust developers with an Info.plist key; the whole Gatekeeper and Developer ID system is based on trust. If that trust is violated, then Apple has the ability to revoke a developer’s signing cert, but thankfully the nuclear option has rarely been necessary. Update (2016-07-11): The public beta version of DropDMG can now create signed disk images to avoid Gatekeeper path randomization. Update (2016-07-21): DropDMG 3.4 is now available with support for creating signed .dmg disk images and .xip archives. As I mentioned in an earlier blog post, there’s a new API for App Translocation in the 10.12 SDK: <Security/SecTranslocate.h>. However, if you’re sane, you’re not shipping your apps yet with the 10.12 SDK. So how can you detect App Translocation in your shipping apps? The trick is that since you can’t link against the new functions, you have to load them at runtime. I’ve provided sample code below. Therefore, we’re faced with the odd situation where App Translocation affects our apps, but there’s no supported way to detect it, not even with the latest SDK. It’s unclear how this situation can be tenable. As we’ve seen, though, Apple works in mysterious ways. Thankfully, the SecTranslocate symbols still exist in the Security.framework binary, so the technique explained in my last blog post continues to work. The Dude abides. If you put these two things together it becomes impossible to create permanent (“Forever”) rules in Little Snitch for apps that are still in quarantine, because each time they are launched they will be launched from a different path. The kicker is that this App Translocation issue only occurred on Sierra. On High Sierra, the SafariServices API calls work even when the app is running from the Downloads folder and undergoing App Translocation. So it appears that SafariServices on Sierra was failing to account for App Translocation, and that bug was fixed in High Sierra. Third parties can use Siri in six different kinds of apps, though those applications encompass a wide range of common and popular App Store offerings: audio and video calling apps; messaging apps; payment apps; apps that allow searching through photo libraries; workout apps; and ride booking apps. That covers a lot of ground, but there’s a lot that’s missing: music and video apps like Spotify and Netflix, mapping apps like Google Maps, and third-party to-do list apps don’t fall under any of these umbrellas, possibly because they conflict too directly in some cases with Apple apps and services like Apple Maps and Apple Music (Apple Maps in particular is becoming more deeply integrated into the OS with every new update). Hopefully Siri will become more useful to a wider variety of apps later on, but for now the first-party apps are definitely still in a privileged position. And Apple didn’t draw too much attention to it yesterday, but these Siri capabilities are only available in iOS 10, not in the newly Siri-fied macOS Sierra. This is so inexplicable. Why can’t I pass a search to a weather app to see the weather for a city? Why can’t I start a podcast in a 3rd party podcast app like Downcast. (Honestly, that’s the time I’m using my phone in the car -- much more than sending SMS by voice) Why can’t I ask Daylite to dial a contact? Why can’t I get tomorrow weather for a city I’m traveling to from my weather app of choice? Honestly the places they open are least useful to me. Although I’m happy there’s finally a developer API for Siri, I’m disappointed that it’s limited to a fairly small set of applications for now. As a user, what I want most is for my favorite shopping and to-do list apps to get Siri integration, something that won’t be possible with what Apple announced today. When asked why Siri’s API is limited to certain kinds of apps, like ride-hailing services like Uber or messaging, Federighi and Schiller once again talked about Apple’s baseline philosophy. Federighi said the decision to go with those apps types was made because Siri largely understands the domains of messaging and requesting purchases, making it easier to give the keys to developers and ensure a great user experience. He also said that Apple is working to expand Siri’s familiarity with certain domains over time. I think this is fundamentally the wrong approach. Imagine how useful AppleScript would be if you could only use Apple’s standard suites. Adoption and innovation would be greatly slowed, and lots of interesting things would never be possible. Amazon’s approach of letting Alexa Skills add their own terminology makes a lot more sense. I care much more about functionality and reliability than about having lots of variant, more natural syntaxes for the basic queries. Secondly, I’m disappointed that there is still no easy way to simply save a bunch of dictated text as a reminder (to be imported into OmniFocus). Most of the time, this is all I want to do when hands-free. Instead, if I say “Remember to,” Siri will try to parse the following text and inevitably mess it up. See also: WWDC Session 217: Introducing SiriKit. Limitations of SiriKit are baffling when you think about Siri’s universal search for media on the Apple TV. I understand that this allows us to skip translation, but is that really that big a deal? Smart folk are internationalizing (there’s a better word for that; sorry) their apps now, translating labels and other text throughout. I also get that Apple might do a better job with grammar, so that there are lots of ways to get across a command in natural speech rather than forcing a strange, app-specific grammar. I don’t feel that’s a big win. How generous is Microsoft’s takeover bid? It puts LinkedIn’s enterprise value at 79 times the social network’s earnings before interest, taxes, depreciation and amortization, or Ebitda, for the 12 months that ended on March 31. On the basis of that multiple, the transaction is more expensive than any big internet deal paid with cash, according to data compiled by Bloomberg. Microsoft is paying $220 for each of LinkedIn’s monthly active users. By comparison, when Facebook acquired WhatsApp for $19 billion two years ago, it spent $40 for every user. LinkedIn builds a bridge for their productivity business to a new world centered around end users, not corporations, and it may even give Microsoft’s inevitable compete products a head start. Imagine this: instead of simply moving Active Directory to the cloud, Microsoft is potentially making LinkedIn the central repository of identity for all business-based interactions: chat, email, and more, and it’s an identity that endures for an end user’s professional life, because it’s managed by the user, not by their transient employer. It’s genuinely exciting, and shocking though it may have been, I think that’s worth $26 billion. That’s a lot of money but it seems like an obvious fit. Also, Nadella was probably tired of getting all those LinkedIn emails. Microsoft’s track record with multibillion-dollar acquisitions is, well, terrible. But why would Microsoft want to own the world’s second uncoolest social network — the first, of course, being Google+ — when it’s effectively a glorified and unprofitable résumé hosting service? Previously: Pre-WWDC Thoughts, WWDC 2015 Links. That syncing tool has now been moved out of the core Facebook app and into the photo app Moments. Facebook made it clear that this would happen — and in fact it happened months back, seemingly without much pushback. What Facebook was less clear about was what would happen to photos that had previously been synced. At the time, Facebook mentioned that people would be given the chance to download their pictures in a zip file if they didn’t want to move over to Moments. Now it’s clear that offering is because Facebook intends to completely delete synced photos if people don’t download this new app. This has understandably led to panic installations of Moments as people sought to protect the photos that have been automatically synchronized from their phone. It’s important to note that it is only these synced photos that are at risk, but it’s clear that there is an element of confusion about what Facebook is planning to delete. The email the company is sending out to users[…] The email is very poorly worded, and almost has the feeling of spam to it. If you have an app with auto-renewable subscriptions, you have the option of offering free trials to new users. The length of the subscription determines how long the free trial can be. For example, for a monthly subscription you can offer users a 7-day or 1-month free trial. When users sign up for a subscription with a free trial, their subscription will begin immediately but they won’t be billed until the free trial period is over. They will then continue to be billed on a recurring basis, unless they turn off auto-renewal. Within each subscription group, you can offer different levels of service (for example, basic, premium, and pro memberships) as well as durations (such as weekly, monthly, or annually). Starting this fall, users will be able to move easily between service levels, and choose to upgrade, downgrade, or crossgrade (that is, move to another identically ranked auto-renewable subscription in the same subscription group) as often as they like. After a subscriber completes one year of paid service of your auto-renewable subscription, you automatically receive 85% of the subscription price, minus applicable taxes, on the subscriber’s subsequent renewals. Opening this URL launches iTunes or iTunes Store, and then displays the Manage Subscription page. Until now, subscription pricing was reserved for apps that served media content: streaming audio and video, news, etc. Apple is now opening it to apps from any category, which effectively solves the problems of recurring revenue and free trials. This could be the change that makes the market for professional-caliber iPad apps possible. On the Mac, there has long been a tradition of paying a large amount of money for a pro app, then paying a smaller amount of money for major updates. The App Store has never allowed for that sort of upgrade pricing — but upgrade pricing is what enabled ongoing continuous development of pro software. Paying for each major new version, however, is arguably a relic of the age when software came in physical boxes. Subscription-based pricing — “software as a service (SaaS)” — is the modern equivalent. That’s the route both Microsoft and Adobe have taken. In the old world of boxed software and installation disks, the natural interval was the version. In today’s world where everything is a download, months or years are more natural payment intervals. I think all serious productivity apps in the App Store should and will switch to subscription pricing. In a sidebar titled “Types of Auto-Renewable Subscriptions”, Apple lists only two, “Content” and “Services” […] Professional apps that require “a lot of maintenance of new features and versions” don’t fit either of those categories. Would Twitter clients like Tweetbot and Twitterrific qualify for subscription pricing? After talking to Schiller yesterday, I thought so. Now, I don’t know. Developers are definitely confused. It’s also not clear whether Apple will require, as it does with in-app purchases, that the app be useful without a subscription. It’s hard to predict the effects of subscriptions without knowing the answers to these key questions. I’m cautiously optimistic because Apple is finally trying to address the problems of trials and sustainability. On the other hand, you could look at it as: this is Apple’s answer. There definitely won’t be true free trials or upgrade pricing any time soon—or, probably, ever. The 85/15 revenue split after a year is also encouraging, not only because Apple is acknowledging that “the developer is doing most of the work,” but also because it opens the door to other fee adjustments in the future. I think there are a lot of cases where something lower than 30% would make sense. Interestingly, Google has already one-upped Apple and gone to 85/15 for the first year, too. Assuming that any app could use subscriptions without restrictions, what would that mean? Subscriptions are definitely controversial. Customers generally don’t like them, though they may end up being the least bad option. One issue is the loss of control. It feels better to look at what’s in a new version and decide whether it’s worth it, rather than keep paying just to keep using what you already have. However, the trend is clearly toward everyone running the latest version, rather than supporting old versions. Simply maintaining an app takes work, and it makes sense for payments to reflect that. The other main issue is the overall cost. Subscriptions can really add up, and people will need to think more carefully about budgeting and saving in order to maintain access to key apps if their circumstances change. From the developer side, recurring revenue is key, but will customers be reluctant to sign up? Even as someone who likes to pay for apps, I think twice about subscriptions. In a competitive marketplace, will customers find a subscription product attractive next to a competing one that is a one-time purchase? Will it help that only the subscription product can have a trial? How often will customers be able to try the app? How can a developer figure out a fair ongoing price up front, when it’s not known how the app’s launch will go or what path its future development will take? Will providing your own server and implementing subscriptions prove to be a difficult hurdle? I’m surprised that Apple does not provide a way to handle this automatically. How will apps transition to subscriptions? Will they wait until when the next major upgrade would have been? How will existing customers react? Will they get special consideration? What will happen to the corresponding direct sale versions of the apps? Will they continue to be available with traditional upgrade pricing? Or will they try to honor the App Store subscription? Or offer a parallel subscription using a different payment processor? I think the best thing that can be said for subscriptions is that they’re honest and mostly align everyone’s incentives properly. Customers will essentially vote with their wallets, on an ongoing basis. Developers who maintain and improve their apps will get recurring revenue. Apple will get more revenue when it steers customers to good apps. Over time, more of the money will flow to the apps that people actually like and use. My guess is that the average customer will end up spending more money on fewer paid apps. Some apps will become more sustainable, but others will be culled. It remains to be seen how the search ads will work in practice, but my overall reaction is negative. 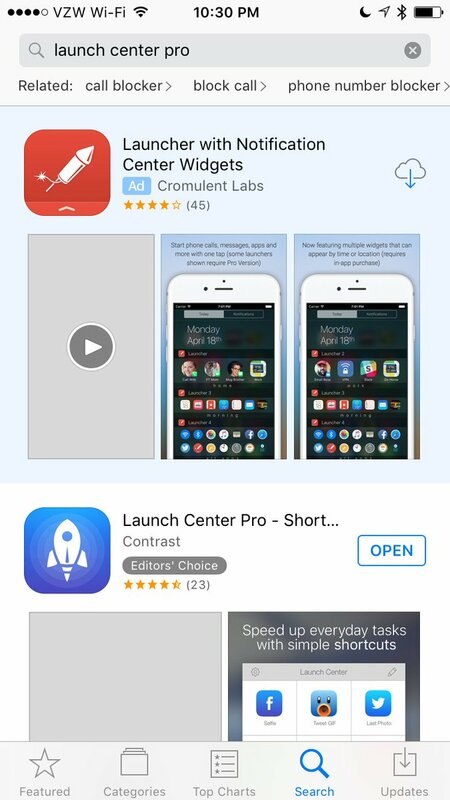 An iPhone screen currently only displays two App Store search results at once. Now, the top one of those will be an ad, although customers may not realize it’s an ad. In theory, search ads could help a quality unknown app gain traction. But indie developers fear that big companies will use big ad budgets to tilt the playing field. And everyone may feel compelled to pay protection money just to keep their app in the search results for its own name. Lastly, everyone wanted Apple to fix search. Not only do search ads not do this, but they seem to give Apple a perverse incentive not to fix it. These are clearly the biggest changes since the dawn of the App Store. I see it as a good sign that something is happening. However, much remains to be done. The store apps themselves need work, as do the underlying OS services. The Mac App Store still lags behind, without support for gifting apps or TestFlight, and the sandbox remains a mess. More personally, although I have enjoyed quicker review times than in the past, I continue to encounter problems simply updating my apps. My last two updates were held up for two weeks by a backend store bug that prevented the packages from being uploaded with Application Loader. Then, when one of them was finally ready for sale, I had to pull it from the store. Apple had incorrectly codesigned it so that customers could not even launch it. Why doesn’t Apple have automated testing in place to make sure that the app file that downloads is actually valid? This is a terrible first impression for new customers. And for existing customers, one day the app was working for them, and the next it was not. After several days and failed attempts, it appears that the right people at Apple are now aware of the problem with my app. Meanwhile, I am fortunate to be able to issue customers licenses to the direct sale version so that they can actually use the app that they paid for. I’m confident that my app download will eventually be fixed, but the important point is that problems like these remain common so many years after the store’s launch. Instead of releases becoming routine, there always seems to be a new frustration. It definitely won’t work for every app, though, or even every niche. Once the uncertainty about which apps are eligible for subscriptions is cleared up, I think there are going to be specific qualities that justify a maintenance-style subscription: quality apps for a particular audience, made by indie developers who issue regular updates. And I think it needs all of those factors. Users aren’t going to pay for an app maintenance subscription if the app is of mediocre quality, or if the developer is a huge company, or if it is infrequently updated — or, at least, does not have some sort of ongoing justification for its subscription cost. This article has been updated to reflect clarification from Apple that apps approved to use subscriptions can require a subscription to use the app at all. In short, we don’t have all the answers we need yet. But Apple is aware of the questions. Glad Apple’s aware of uncertainty re subscriptions and types of apps. But shouldn’t they’ve had an answer prior? It’s kind of… weird that they wouldn’t have thought through that prior to making the announcement. Among the apps I’ve bought over the years, a lot of them are quality apps I love and enjoy using, but I don’t necessarily use them all the time. […] I haven’t minded paying the occasional extra for a paid update or for the in-app purchase that unlocked more photo filters or editing features. But in the extreme case that all app developers behind these apps moved to a subscription-based pricing, without offering alternatives, I would be forced into a position I really don’t like: having to decide which app stays on my devices and which one has to go. I wonder how many top class apps will switch to a subscription model. Considering it for @screensvnc but many questions still unanswered. The way most of us treat app purchases today is akin to buying a pair of shoes and expecting the manufacturer to provide free polishing and repairs. Forever. The truth is that the economics of the App Store have never really made sense. We are paying negligible amounts once while expecting continuous development and improvement way off into the future. I still kinda want to decide for myself how long I’m wearing an old pair of shoes, and when I’m getting a new one. Small developers shouldn’t make the mistake of thinking their app is like electricity, when it’s actually more like a pair of shoes. Really odd that the Subscription session [at WWDC] didn’t cover any of the ongoing conversations about what’s acceptable as a subscription. During the live show with @gruber Schiller said they want everyone to use it, but are just leaving themselves wiggle room. Hard to account for “wiggle room” when you’re deciding to invest in building a new app, though. Update (2016-06-20): Phil Schiller talked more about subscriptions and search ads at The Talk Show Live. New sources have come forth claiming that Apple is in fact aiming to phase out digital music downloads on iTunes, despite the fact that Apple rep Tom Neumayr specifically stated such rumors were “not true” in May. According to the sources, Apple might be gearing up for an iTunes revamp that would introduce software architecture with the ability for the company to “more easily drop iTunes music downloads” down the road. This would allow Apple to subtly shift the service towards the streaming and radio side of things in the event that paid music downloads drop off precipitously. This would be very disappointing, if true. There’s no end date, and as a matter of fact, they should all be surprised and thankful to the results that they’re seeing because our music iTunes business is doing very well. Downloads weren’t growing, and certainly are not going to grow again, but it’s not declining anywhere near as fast as any of them predicted or thought it would. There are a lot of people who download music and are happy with it and they’re not moving towards subscriptions. Digital Music News today reports that Apple is “on schedule” to rid the iTunes Store Music Store of downloads by 2019. Apple’s plan to replace digital music sales with Apple Music will be completed by late 2019, according to our sources. Users who own digital music will have their libraries merged with Apple Music. Users not on the service will be encouraged to join, however, if they choose not to they will still be able to listen to their library. They are essentially doubling the price from $99 every two years to every one year, but it’s not really a subscription because if you stop paying you can keep using the version that you have. The only good desktop Mac available today is the top-of-the-line iMac. Everything else is a goddamned embarrassment: terrible values for the price and clearly products of neglect. In fact, I noticed yesterday that Ramjet is now offering tower-style Mac Pro 5,1’s retrofitted with new CPUs and 1 TB SSDs, and they are arguably more compelling than Apple’s brand-new Mac Pros (and cost $2,000 less!). It takes you back to the days when Power Computing’s Mac clones made a mockery of 1995 Apple’s Performas and 5000-whatever models. Shazam and Twitterrific are best-of-breed apps on the iPhone, but their Watch apps are straight-up non-functional. Do we think the developers suddenly lost their mojo, or is it that the Watch APIs and internal systems simply do not work reliably enough to build third-party apps atop? Of those, the MacBook and the iMacs are both fine; they were updated fairly recently and there’s not a whole lot you could change about either machine with current technology. But the “Pro” machines especially are notable in a bad way. Mac designs have always lasted for longer than iPhone and iPad designs and Apple’s release schedule is at least partially determined by Intel’s, AMD’s, and Nvidia’s, but that’s a long time to go without revisiting designs. Rumors suggest Apple will be paying some much-needed attention to its Mac lineup later this year, possibly at WWDC and possibly in the months after. In the meantime, let’s walk through features Apple could add to the platform and things it could change about individual Macs to keep pace with and get back on top of the industry this company once led. A totally redesigned Mac Pro was announced with much fanfare at WWDC in 2013, three years after the old “cheese grater” Mac Pro got its last significant update. More importantly, it’s way past time for both the Mac Pro and the MacBook Pro to receive updates. The Mac Pro hasn’t been updated in ages, to the point where it’s actually embarrassing that Apple’s still charging full price for such old technology. …and a new file system. Perhaps most importantly, Apple is likely to finally release a software development kit (SDK) to developers so that they can integrate Siri into their own apps. In an attempt to keep the user experience in check, Apple has always given its own apps the first priority. For example, a hyperlinked email address in a messaging app when clicked, will open the Mail app, and not Gmail. Or when a location is shared on WhatsApp, it is Apple Maps that opens up by default, not Google Maps. Although past experience doesn’t suggest Apple will let people choose their default app preferences, letting Siri roam beyond the walled garden can provide 3rd party apps a level playing field at least with voice control. Here are five things I’ll be glad to say to Siri once developers are given access, effectively bypassing some of Apple’s mediocre service offerings. Of all the things I wish to see at WWDC next week, improvements to search — across the board — rank highly on my proverbial list. The company has come a long way in a very short period of time, but search still isn’t good enough; searching on both the App Store and Maps, in particular, remain among the most frustrating experiences on any of Apple’s platforms. iOS needs to handle files better, specifically on external drives. I should be able to attach an SD card (or even a USB hard drive) full of files to my iPad Pro and import the files I need; right now, if it’s not a video or audio file, I’m out of luck. A Mac OS upgrade which is about bug fixes and minor features. Maybe even moving to an 18 month upgrade cycle instead of a yearly one. My answer is the same as it’s been for years: “Bug fixes and security enhancements.” I’m a bit over the yearly update cycle. I’d just like an Xcode, tool-chain that actually works. As for me, the number one thing I want from WWDC is for Apple to focus on fixing bugs (in the OSes, apps, services, and Xcode). WWDC kicks off in just a few days, which means it's prediction time. This year I've got one that's a little off the wall: Not only will there be an API for Siri, but it'll be iCloud-based and take advantage of Swift on the server. I toyed around with a few ways to fix this issue, including making the instance variables optional and filling in the defaults at the usage site, but that ended up being just as clunky as the big initializer. What I settled on was: instead of making the variables optional, I made them mutable. That solves quite a few problems. Even though I’ve been keeping up with Swift blog posts, my first Swift app was a port of an old and crusty Objective-C code base, and I carried over a lot of old habits. In looking back over it, I found many small- to medium-sized changes that make the code cleaner and more Swifty. Maybe I can help you avoid similar mistakes. Sadly, you can’t make protocol conformances private, but otherwise you should be using private extensions wherever you aren’t required to make them public. There are certainly cases where direct comparison to nil are appropriate, but Swift’s language features make it pretty rare in my experience. Since you can extend any type, it’s convenient to make extension files for your utilities on CGRect, CGPoint, UIInterfaceOrientation, and other types that couldn’t be extended when they were lowly C structs. So don’t litter your main code files with one-off domain-specific utilities on system types. Put them in a separate file and write a couple of unit tests just for that file. At first, I didn’t think too much of this bridging header. Sure, I want to access my Objective C files from Swift. Which ones? Why not all of them? My takeaway is to accept that it is fundamentally unsafe to interface with Objective C classes whose headers have not been audited for nullability. At its heart, this series of essays is a comparison of the current state of Google’s and Apple’s cartography. But it’s also something more: an exploration into all of the tradeoffs that go into designing and making maps such as these. He does not look at rural areas, on the grounds that “the things that are labeled are the area’s only things.” Nonetheless, I’ve still noticed major differences, with Apple Maps typically omitting smaller roads, in favor of showing nothing, unless you really zoom in. In urban areas, I like that Google always shows the transit stations. As noted earlier, I find the most striking difference to be search. Google Maps is very good at it; Apple Maps isn’t. The latter is getting better, insomuch as it less-frequently shows me results in Delaware and Washington D.C. instead of Calgary, but Google is still leaps-and-bounds ahead. O’Beirne refrains from calling one or the other superior, but for me, the clear difference is that Apple Maps is concerned with cartographic integrity where Google Maps is concerned with the experience of using the application. That is to say, at most given zoom levels, Apple Maps presents formally better maps, but holistically, Google Maps presents more of the right information at the right time. Which is consistent with what animates each company: Apple is focused on beauty and elegance, and Google is focused on information delivery. I still greatly prefer Google Maps, both for its design and map data. However, Google has made some changes recently that seem like regressions. Previously: Google Maps & Label Readability. Two huge reasons I prefer Google Maps: Street View and single handed (one finger) zooming. Using a mutex in Swift isn’t particularly difficult but I’m going to use the topic to highlight a subtle performance nuisance in Swift: dynamic heap allocation during closure capture. We want our mutex to be fast but passing a closure to execute inside a mutex can reduce the performance by a factor of 10 due to memory allocation overhead. One of the advantages with closure capture is how effortless it seems. Items inside the closure have the same names inside and outside the closure and the connection between the two is obvious. When we avoid closure capture and instead try to pass all values in as parameters, we’re forced to either rename all our variables or shadow names – neither of which helps comprehension – and we still run the risk of accidentally capturing a variable and losing all efficiency anyway. It turns out that despite being a private function in the same file – where Swift can fully inline the function – Swift is not eliminating redundant retains and releases on the the PThreadMutex parameter (which is a class type to avoid breaking the pthread_mutex_t by copying it). But despite the speed increase, using a semaphore for a mutex is probably not the best approach for a general mutex. Semaphores are prone to a form of priority inversion. Long-term, Swift should be able to keep @noescape closures on the stack. By combining GCD and Cocoa’s NSThread API we are drilling through the abstraction that GCD should provide in the first place. APIs that fully rely on GCD and ignore the presence of the underlying threads can run into problems if you call them on the main thread but not the main queue. This means, especially when calling into other frameworks, we should prefer using dispatch_queue_set_specific and dispatch_get_specific to check if our code is running on the main queue over using NSThread.isMainThread(). It’s hard to get this right because of reentrancy, though. Argument of '#selector' refers to a method that is not exposed to Objective-C.
We cannot simply add @objc to this method in the original ViewControllerType protocol for a number of reasons. If we do, then the entire protocol needs to be marked @objc, which means[…] Our example here is simple, but imagine a much more complex object graph that makes heavy use of Swift’s value types and a hierarchy of three protocols with this one in the middle. Introducing @objc as the fix-it suggests would break the entire world in our app. We can decompose this protocol by separating out all of the @objc code into its own protocol. Then, we can use protocol composition to reunite them. Southtree does its own work out of a 40,000 square-foot production facility in downtown Chattanooga, Tennessee. They have over 1,000 playback machines. I liked what I read on its site. What’s really odd is that Southtree, YesVideo and other competitors seem hell-bent on converting your old tapes to DVDs. […] What I wanted, of course, was for all of the video to be put onto a hard drive or flash drive, but none of that is available on Southtree’s price list (or YesVideo’s). Nick assured me, though, that they do offer this service. If that’s what you want, you sign up for the DVD conversion and then type something like, “copy to the drive I’ve supplied” in your order notes. The App Store’s Top Free, Paid, and Grossing charts are probably the most effective aspect of the App Store […] The trouble is, without a good way to discover apps beyond the most popular ones, it is extremely hard for new apps to break into the charts. Instead, the very existence of the charts perpetuates the position of the apps already on them, making it even more difficult for a new app to break into the charts. As I write this, Twitterrific is the fourth result if you search for ‘twitter.’ The search results also include many other relevant results, but still return games, alarm clock apps, and other irrelevant results. In my own experience, I have found that search results are also often inconsistent between platforms. The results returned for an app search in iTunes are often different than the results I get from the App Store on iOS, which are both different than the results returned by the iTunes Search API, which are oftentimes the worst of all. In short, App Store search results have two main problems – relevance and consistency. Another area that needs work is search ranking. Precisely what goes into the ranking of search results is unknown and changes from time to time, but the rankings seem broken, which is curious. In this paper, we show how a fabrication-time attacker can leverage analog circuits to create a hardware attack that is small (i.e., requires as little as one gate) and stealthy (i.e., requires an unlikely trigger sequence before effecting a chip’s functionality). In fact, researchers at the University of Michigan haven’t just imagined that computer security nightmare; they’ve built and proved it works. In a study that won the “best paper” award at last week’s IEEE Symposium on Privacy and Security, they detailed the creation of an insidious, microscopic hardware backdoor proof-of-concept. And they showed that by running a series of seemingly innocuous commands on their minutely sabotaged processor, a hacker could reliably trigger a feature of the chip that gives them full access to the operating system. Most disturbingly, they write, that microscopic hardware backdoor wouldn’t be caught by practically any modern method of hardware security analysis, and could be planted by a single employee of a chip factory. The “demonically clever” feature of the Michigan researchers’ backdoor isn’t just its size, or that it’s hidden in hardware rather than software. It’s that it violates the security industry’s most basic assumptions about a chip’s digital functions and how they might be sabotaged. Instead of a mere change to the “digital” properties of a chip—a tweak to the chip’s logical computing functions—the researchers describe their backdoor as an “analog” one: a physical hack that takes advantage of how the actual electricity flowing through the chip’s transistors can be hijacked to trigger an unexpected outcome. I wonder why the iOS sandbox omits certain sandbox checks if code is signed by Blizzard Entertainment Inc. It looks like if you are signed by blizzard you can execute whatever executables you find on an iOS device. This struck people as dangerous and unfair, which perhaps speaks to how much faith developers have in Apple fairly enforcing its own rules. However, it turns out that it’s not actually a sandbox exception but rather a workaround for a crashing bug. This path is for the access() call, not for the actual enforcement. But it doesn’t mean they can execute, it means we make them believe they could. Practically speaking, all sandboxing rules still apply to Blizzard apps; workaround doesn’t allow operations that other apps can’t do too. And Blizzard has fixed their updater, so the workaround shouldn’t be needed in next update. My takeaway is that Apple will go to extraordinary lengths to avoid crashers in super-popular apps, even when it’s entirely the app’s fault. As part of our ongoing commitment to transparency, Yahoo is announcing today the public disclosure of three National Security Letters (NSLs) that it received from the Federal Bureau of Investigation (FBI). This marks the first time any company has been able to publicly acknowledge receiving an NSL as a result of the reforms of the USA Freedom Act. As explained in our Transparency Report, an NSL is a type of compulsory legal process used by the FBI in national security investigations. The letters Yahoo is making public today were received in April 2013, August 2013, and June 2015, respectively. Yahoo complied with these three NSLs and, to the extent we had the information requested, we disclosed it as authorized by law. Specifically, we produced the name, address, and length of service for each of the accounts identified in two of the NSLs, and no information in response to the third NSL as the specified account did not exist in our system. Each NSL included a nondisclosure provision that prevented Yahoo from previously notifying its users or the public of their existence. For months now, I’ve complained about the software giant’s heavy-handed tactics in trying to trick customers into upgrading to Windows 10. But a recent change to the Get Windows 10 advertisement that is forced on Windows 7 and 8.1 users takes things entirely too far. This is indefensible. Yup, happened overnight to one of the attendants of our 2-weeks international meeting last week, couldn’t reboot her laptop, hosed. If the user is supposed to make a choice, present the options as buttons, and disable the close widget. Force them to make that choice. Update (2016-06-03): See also: Hacker News. It’s clear that something simple like reading and responding JSON could be made better in a lot of the popular web frameworks out there. The ability to access nested request data easily and without worrying about crashes is essential to every day web development. Swift makes some of these basic, repetitive tasks more concise, expressive, and safe. It’s also a lot faster. The wallpaper behind the windows is always a very important part of a product branding. Apple is particularly good at choosing the right image. Here is a gallery of default wallpapers of every Mac OS X version. This kind of type eraser lets us convert a protocol with associated types into a generic type. That means we can put it in properties and return values and other places that we can’t use protocols directly. Yes, we’ve implemented the methods of SequenceType three times. And you’d need to do this again for every protocol you wish to provide a type-erased wrapper for. It’s rather a lot of code to write, but doing this work will make your protocols feel more like first class citizens. This is where type reification comes in: We make an abstract type concrete by filling in its placeholder types. Wrapper classes are conventionally prefixed with the word “Any”, in order to guarantee that you will instantiate an object that implements our protocol and fills the generic type, without necessarily having the implementation on hand. I feel the best definition that I have at the end of my road of preparing this talk is that type erasure is this design pattern where you have a wrapper class that has a constraint in the initializer method such that you can only initialize it with an instance of an implementation of the protocol you are trying to make concrete. Passing a generic type parameter to a protocol’s associated type member. This still feels like an overly complex fix for something that should just work and hopefully it will in the future. For now, this is a super good pattern to know when working with protocols with associated types. See also: Type erasure in C++: how boost::shared_ptr and boost::function work. Previously: Swift Protocols With Associated Types. If you have to keep using type erasures to actually work with your types, doesn’t that suggest something? Maybe I don’t get it. Being only as precise as you need to be lets you stay flexible and avoid unnecessary refactoring. Only keep the types you need. Type hoarding is unhealthy and may require professional help. Update (2016-06-02): Elmar Kretzer posted an example of a type-erasing struct. Update (2018-03-09): See also: Hector Matos and Mike Ash (Hacker News).